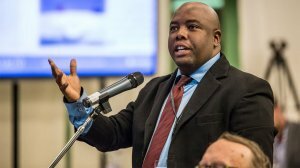 The Democratic Alliance's (DA's) Stevens Mokgalapa was elected at a special council meeting on Tuesday. He was the only nomination from the floor. "It has become clear to me and the DA that unless we govern the Gauteng province with an outright majority, the fate of the people of Tshwane will soon be the fate of the people of Gauteng across the board," wrote Msimanga in his resignation letter. African National Congress Gauteng provincial secretary Jacob Khawe said the DA was attempting to save itself with the move.